Since it became a trading post two centuries ago, Hong Kong has been a melting pot of Western and Eastern cultures. 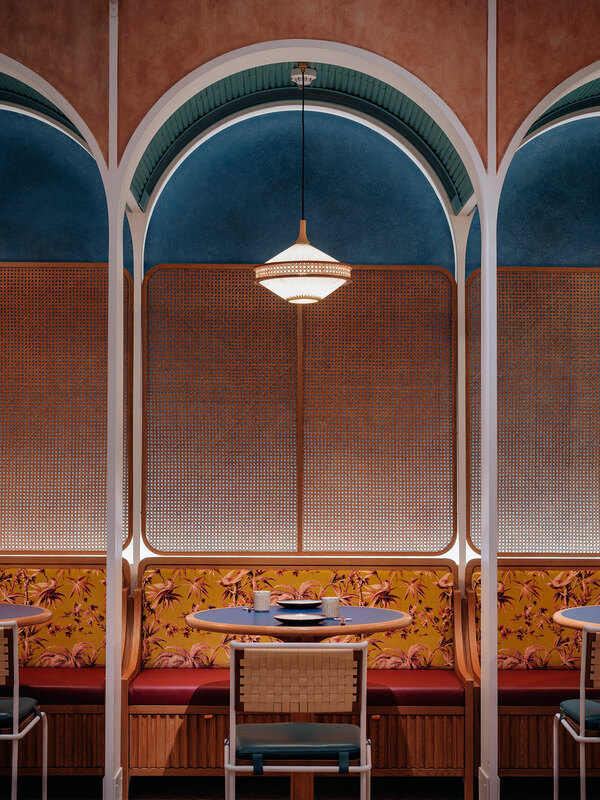 ‘John Anthony’, a new Cantonese grill & dim sum restaurant on Hong Kong Island, sumptuously reflects the city’s west-meets-east sensibility through its innovative culinary offerings as well as its immersive interior design. 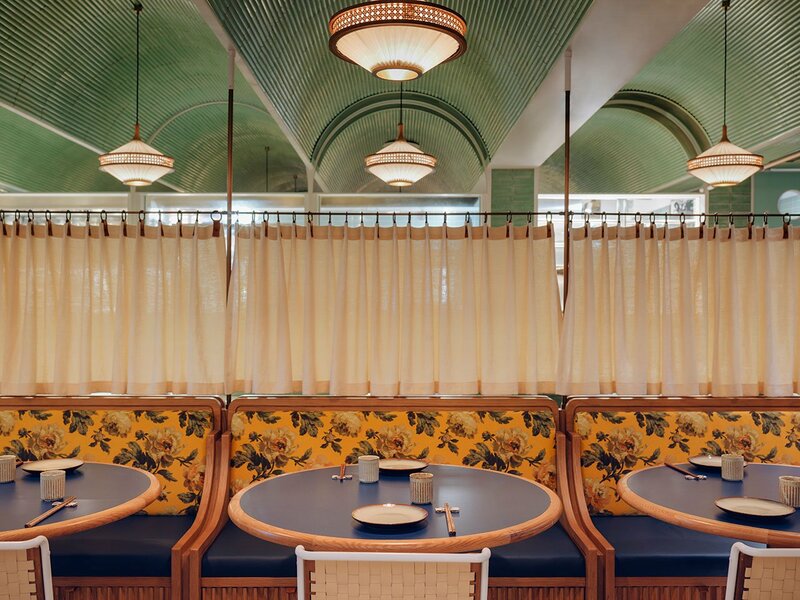 Drawing upon British tea halls and Chinese canteens, local architecture and interior design practice Linehouse have combined colonial architecture with eastern detailing to create a contemporary space of retro flavor and nostalgic elegance. Conceived as a paradigm of sustainability by Maximal Concepts, a hospitality brand behind many of the city’s most iconic restaurants, the venue takes its name from John Anthony, the first Chinese man to be naturalized as a British citizen in 1805, and a key figure in the expansion of global trade during the Qing Dynasty. Stationed at London’s East End docks as a trading interpreter for the East India Company, John Anthony spent 35 years taking care of Chinese and Southeast Asian trade sailors who had journeyed from the Far East, providing them with food and shelter and protecting their rights. 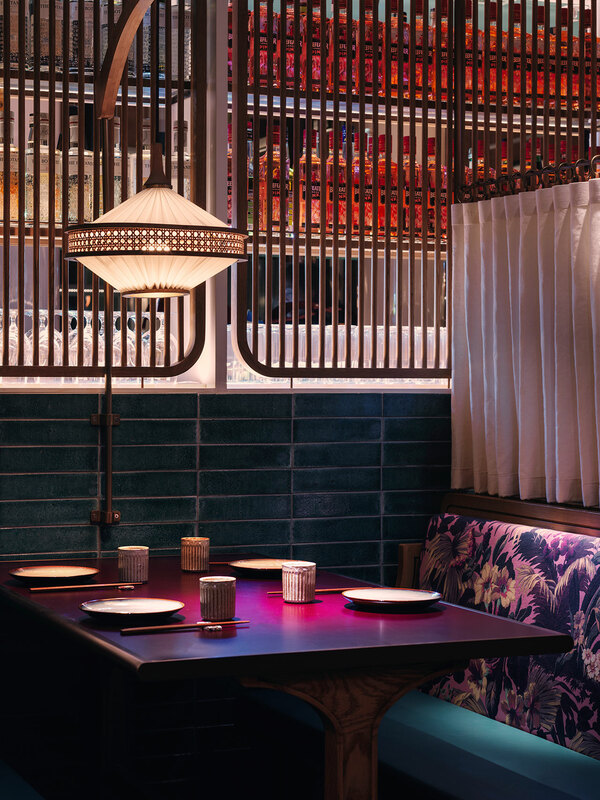 Known as the Father of London’s first Chinatown, John Anthony embodies the cultural diversity kindled by the trade between East and West, which the restaurant channels through its menu of charcoal grill-roasted meats and handmade dim sum spiced with bold influences from regions along the Spice Routes. 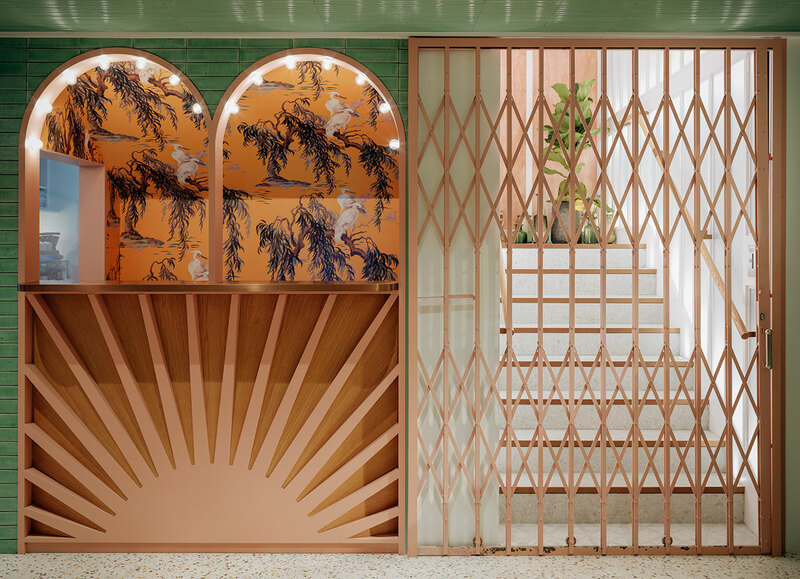 The menu’s fusion of eclectic influences is also mirrored in the restaurant’s interior design which is based on materials and techniques that John Anthony might have encountered along his journey from China to London such as hand glazed tiles, natural and racked renders, terracotta, hand dyed fabrics and hand woven wickers. 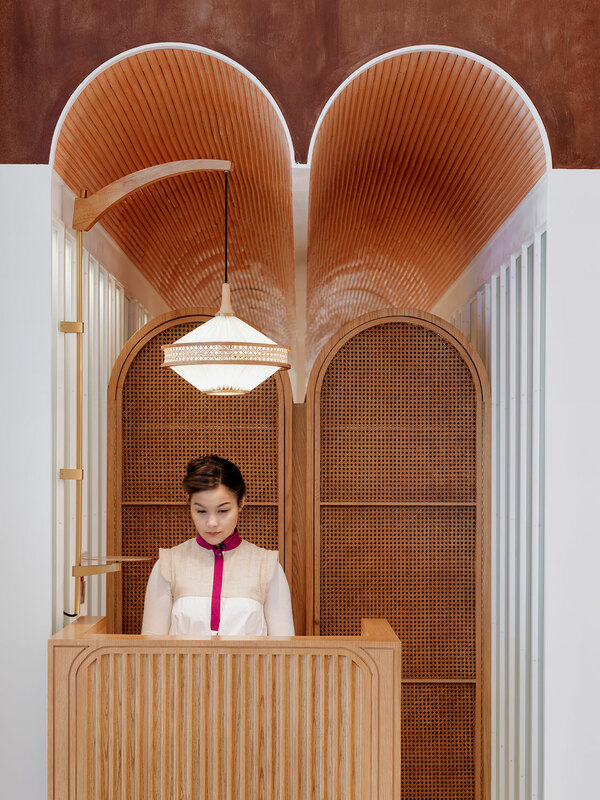 A ground floor vestibule functions both as the restaurant’s reception as well as an evocative preview of what awaits guests in the dining area on the floor below. 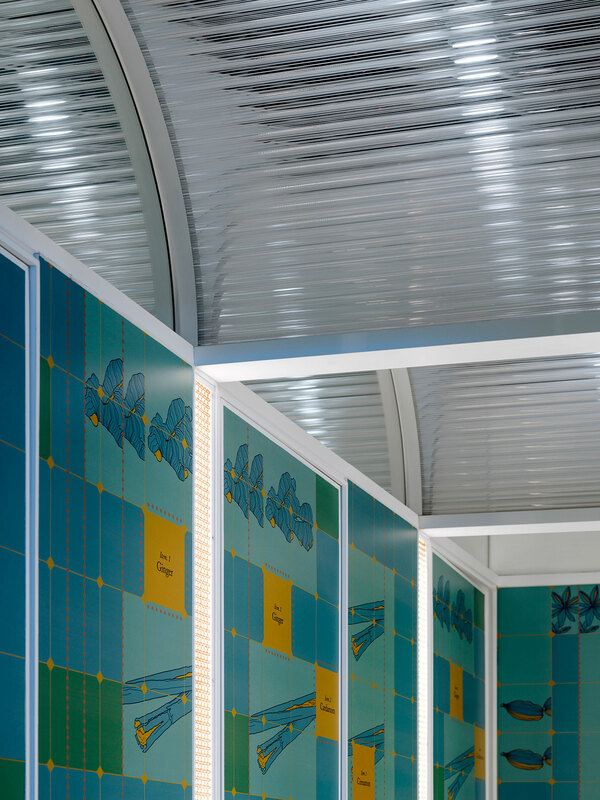 A barrel vaulted ceiling lined with glossy pink tiles and enhanced by mirrors is complemented by terracotta rendered walls and a lime green terrazzo floor, setting the mood for a nostalgic journey along the Spice Routes. 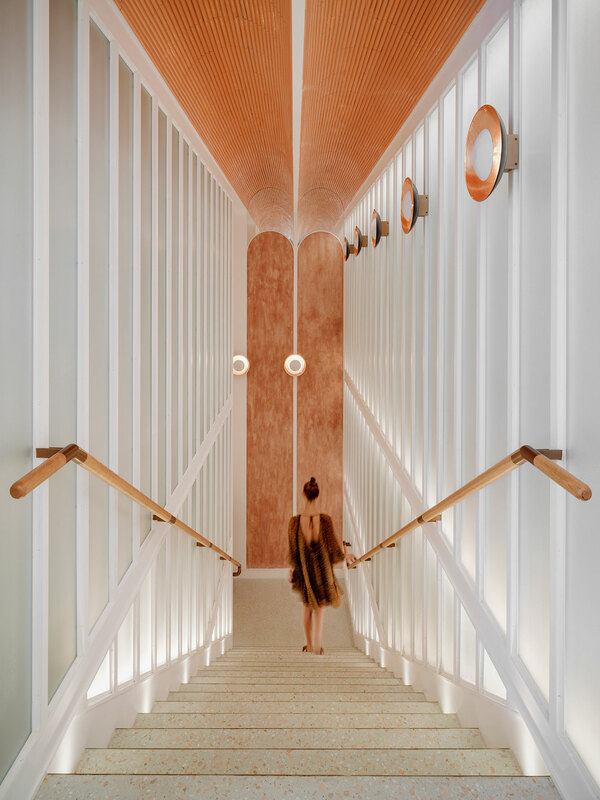 A white staircase leads guests downstairs to the dining hall which is conceived as an elegant interpretation of the Victorian storehouses where John Anthony once worked. 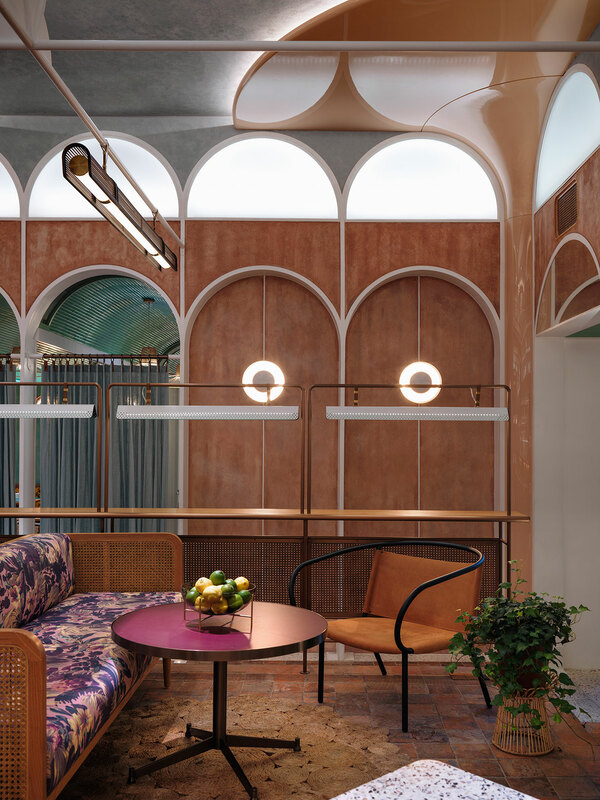 Vaulted ceilings that used to define drab storage spaces have been slimmed down and lined with polished green tiles, while on the floor, reclaimed terracotta tiles that once belonged to now abandoned houses in rural China introduce more earthy tones. Similar in tone but much softer in texture, cream linen curtains on copper rails and floral upholstery complete the room’s eclectic design. 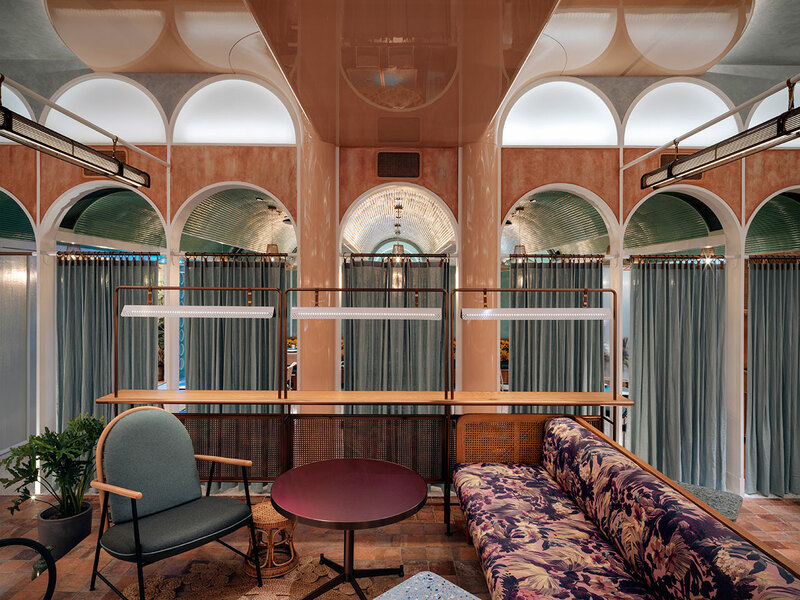 The billowing rhythm of the ceiling vaults is picked up by white metal arches in the adjacent bar area whose décor combines a retro aesthetic embodied in circular canopy columns of dusty pink lacquer with colonial detailing. 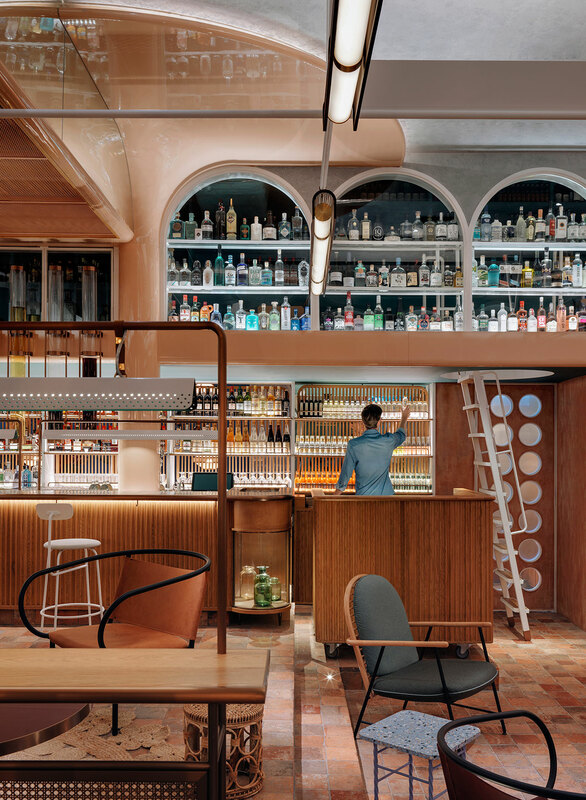 Wicker leaners and furniture featuring gold and maroon floral fabrics elegantly complement a timber bar with glass vitrines and a collection of gin tubes infused with blends of botanicals found along the Spice Routes. 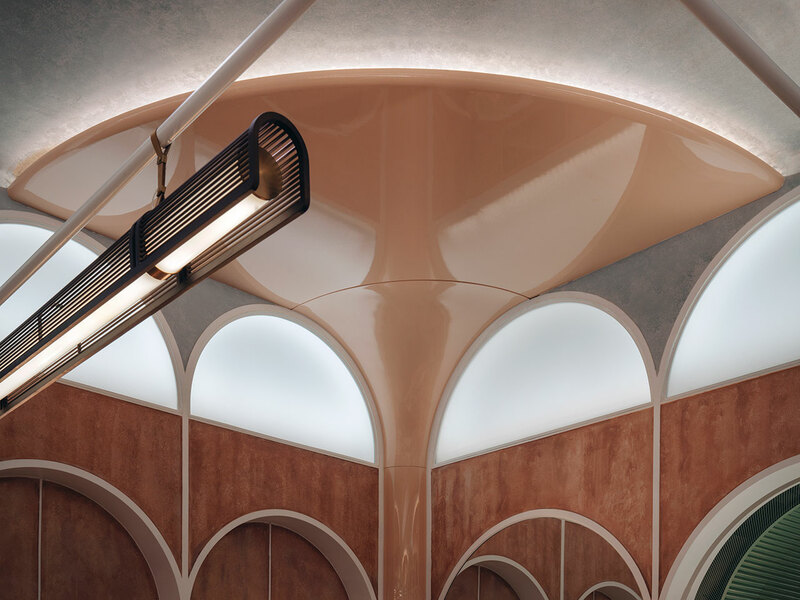 Concealed lighting and illuminated glass arches in the ceiling make up for the lack of daylight while bespoke hammered copper lights on the walls add sparkle. 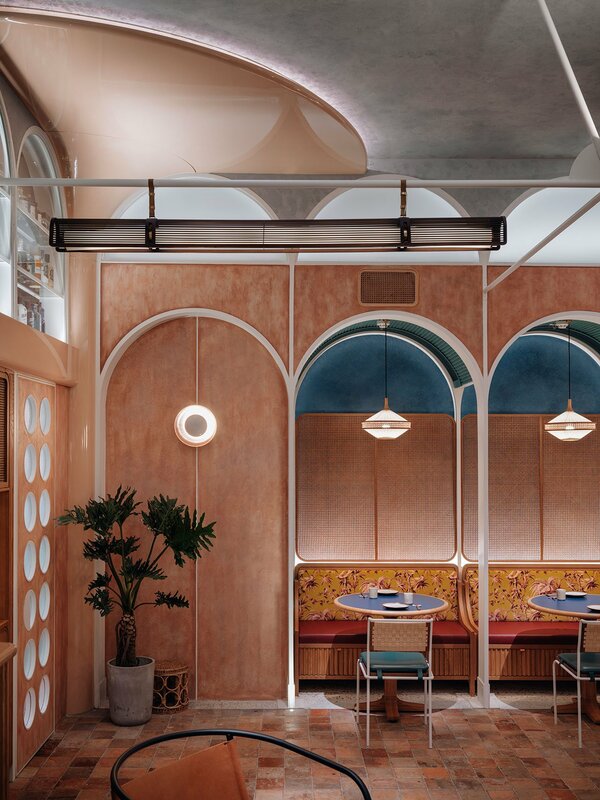 A more intimate dining area next door features colorful dining booths framed by timber screens, green hand painted tiles and ceiling vaults whose geometry is mirrored by the adjacent hand dyed indigo linen billowing on the ceiling, again an allusion to the sea voyages along the Spice Routes. 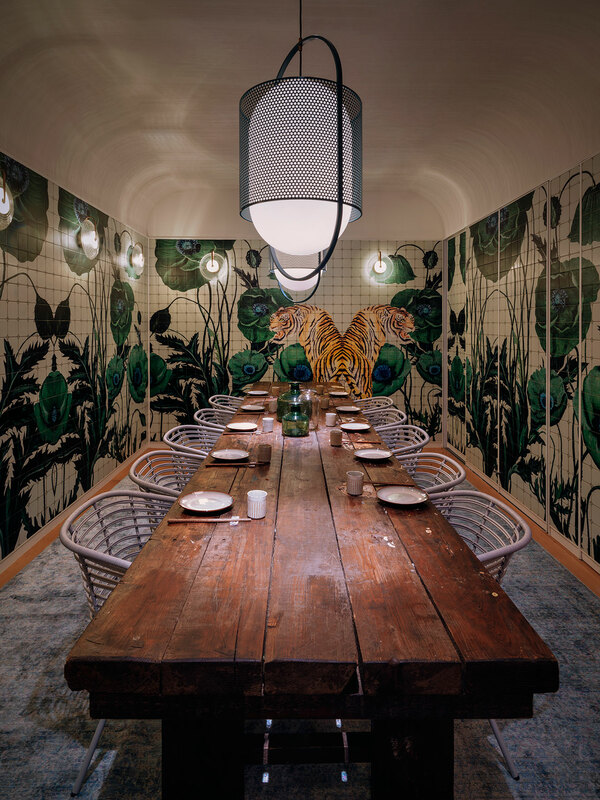 Hand painted tiles are also featured in the restaurant’s private dining room, but whereas those in the public dining areas are monochromatic, here guests can enjoy large scale illustrations of commodities traded between the British and Chinese in the 18th century such as medicinal poppies and exotic animals. 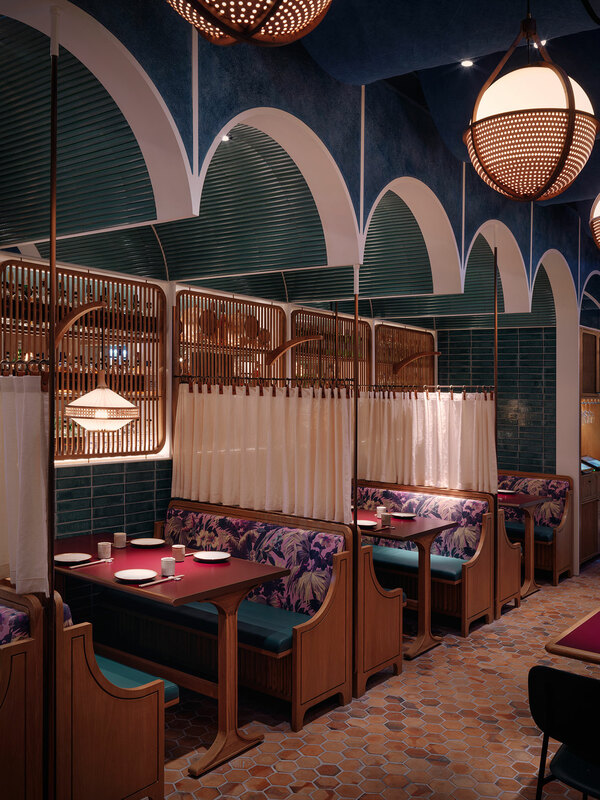 Spices, another precious commodity traded at the time, is referenced in the bathroom walls which are lined with a bespoke laminate in green, mustard and turquoise, while custom copper mounted vanities and a green arched ceiling further enhance the exotic ambience. Sustainability is tightly interwoven into the restaurant’s design and operations. From upcycling wasted plastic and paper into coasters and menus, to using highly sustainable rattan, and from sustainable food suppliers to wines and spirits sourced from environmentally responsible vineyards and craft distilleries, every element incorporates an eco-friendly or ethical initiative, making John Anthony, the restaurant, a venue of upstanding reputation as was John Anthony, the workers’ advocate.